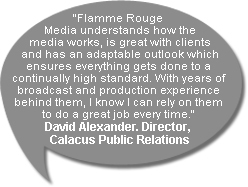 Flamme Rouge Media is a boutique production company with a focus on cycling and sports content, although we do dip our toes in other waters from time to time! We offer bespoke production solutions to suit a variety of budgets and formats, from broadcast television to web promos and Youtube content. Phil decided to pursue his passion for professional cycling and follow the sport from continent to continent. 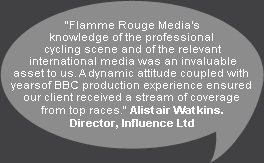 Flamme Rouge Media can draw upon the combined wealth of decades of Grand Tour and Classics experience by partnering with key production staff, presentation talent and ex-athletes who've been there, done it all and got the T-shirt. We crew on a job-by-job basis to offer the best possible value-for-money service to our clients and can work to a range of budgets. Our work has appeared in a variety of national and international media and we've provided services to a wide range of sectors.